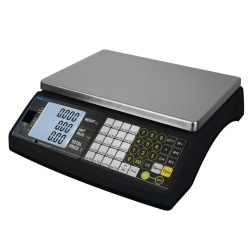 The dual-range Adam Equipment Raven scale facilitates efficient retail weighing and price computing. Backlit LCDs on the front and rear of the scale show weight, unit price and total price, so they are visible by both operator and customer. The Raven's large stainless steel pan removes for quick cleaning between sales. For fast configuration and easy operation, the Raven has 44 keys, some of which are color-coded to facilitate quick recognition of frequently used buttons. AC adapter and rechargeable battery are included. The Raven has EU Type Examination certification and NTEP approval.